Deciduous forests and thickets, especially on floodplains and river banks. Sometimes cultivated, and possibly plants forming thickets at the edge of a deciduous forests in Charlevoix Co. are of such an origin rather than disjunct. Our only species in this small family is a distinctive large shrub with opposite trifoliolate leaves and an inflated, usually 3-lobed indehiscent “capsule” with papery walls that pop when crushed. 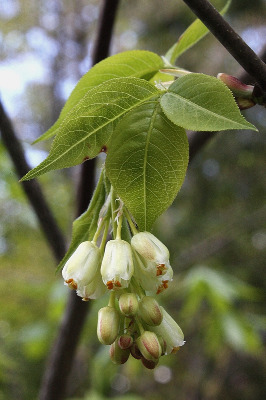 Confusion with Ptelea is surprisingly frequent, and if one is puzzled by a vegetative specimen it is necessary only to remember that Ptelea has alternate leaves with leaflets entire or nearly so, whereas Staphylea has leaflets finely and closely toothed. The whitish flowers appear in rather showy drooping panicles with the leaves in the spring; the unique bladder-like fruit in late summer is ca. 3–5 cm long, at first green but becoming yellow-brown. MICHIGAN FLORA ONLINE. A. A. Reznicek, E. G. Voss, & B. S. Walters. February 2011. University of Michigan. Web. 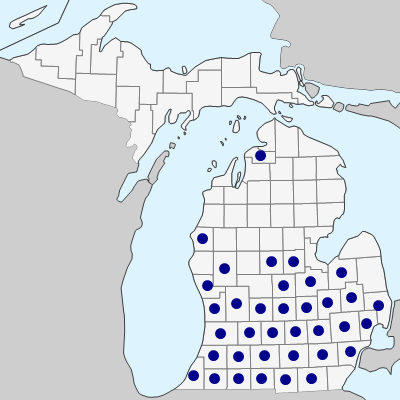 April 25, 2019. https://michiganflora.net/species.aspx?id=2717.